Kaufman Lynn Construction has broken ground on Phase I of Encore Capital Management’s Plantation Walk, a $350 million mixed-use development in Plantation. 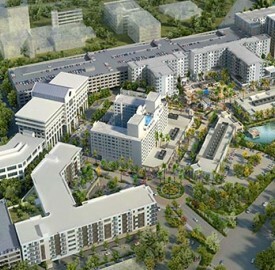 Phase I is set to include a seven-story building with 171 multifamily units, 63,000 square feet of retail and restaurant space and 12,000 square feet of amenity space. At full build-out, Plantation Walk will include 700 apartment units, 160,000 square feet of office space and 200,000 square feet of retail space. The site is situated at the former Plantation Fashion Mall at 321 N. University Drive, about eight miles west of downtown Fort Lauderdale. Completion is slated for April 2020.